E-faxing opens up the potential for low cost, high speed international faxing. Through the highly productive and cost efficient laser plain paper fax these opportunities are available to workgroups of all sizes. It also offers Super G3 and ISDN G4 fax transmission facilities and a superb range of practical fax features as standard. 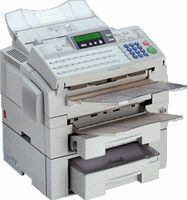 These include a 50 sheet Automatic Document Feeder and Quick, Speed and Group dial keys. Laser printing and scanning facilities further enhance this machine's productivity. Choose from the genuine and compatible toners and maintenance kits below.